Like most families, we love Girl Scout cookies. The popular Thin Mints are among our favorites. We are happy to support the Girl Scouts with their fundraising but the price (currently $3.50 per box) has gone up so much over the years. 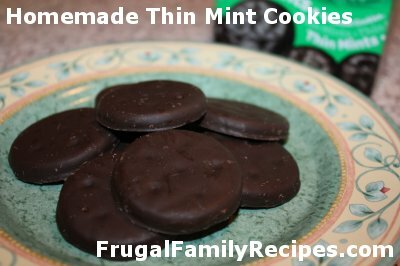 So, we usually make our own "Thin Mint" cookies at home and they are DELICIOUS! They taste almost the same and cost a fraction of the price. And they are SO EASY to make, you will be amazed. We've been doing this for many years and if you haven't tried them yet I hope you will soon. I was a Girl Scout (you're probably not surprised! ), and have fond memories of selling cookies with my mom who volunteered as our scout leader for a few years. Even though the cookies have gone up in price (they were only $1.25 when we sold them), remember this is their main fundraiser for camping trips and other activities. Please support your local troops when you can. Okay, here we go... You can make these in, oh, about 10 minutes! This recipe makes a lot of cookies. We've never used a whole box of crackers or an entire package of almond bark. Probably more like half of each. Oh my goodness, my mouth is watering just thinking about these delicious cookies!!! Melt about 6 ounces of almond bark at a time in the microwave and add 12 drops of peppermint. Quickly dip crackers into chocolate, thoroughly covering both sides, then place on waxed paper to cool. We use a toothpick to help move the crackers in and out of the chocolate. We usually use several toothpicks for a batch of cookies and make a good mess of everything. But is is SO WORTH IT! Move cooled cookies to a container and continue the process until you have the amount of cookies desired. This recipe was originally shared with us by a member of our own Cookie Club at CookieClubRecipes.com. Come on over for a visit, we'd love to have you join us!